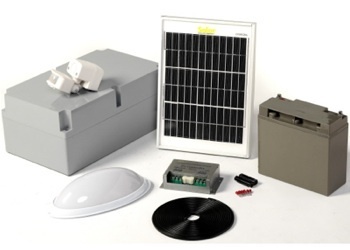 Previously we here at Solar Choice wrote a bit about some of the things you would need to take into consideration when thinking about installing an off-grid (or stand-alone) power system in your home. There are a number of reasons you might want to install an off-grid system, the most obvious but most important of which is that you live in a remote area away from the power grid and want a reliable, cost-effective source of power to run your home. The key difference between a grid-connected system and an off-grid system is the need for a battery bank. Since sunlight is not available at night, and since you’re most likely to require electricity at night for lights, heating, and so on, batteries are indispensable to any off-grid system, and some people may want them even in a grid-connected system in case of a power outage. Unfortunately, batteries are also often the most problematic and costly part of a system. Whereas a typical photovoltaic (PV/solar power) array itself requires relatively little maintenance (besides the occasional cleaning!) and contains no moving parts, the utmost care is required through the process of battery selection, installation, and maintenance; one false move can severely impair the performance of your batteries and result in costly repair bills. This entry, a rough tutorial about how to size a battery bank, is the first in a series of four entries about batteries. The following entries will cover: types of batteries available and typically used, lead-acid battery maintenance, and the different types of stand-alone system configurations and their special considerations. How do I know what size battery bank I will need? Solar Choice can put you in touch with an accredited installer who can give you more detailed advice particular to your circumstances, but your required battery bank capacity will depend firstly on your typical daily peak energy demand and the size of your PV array; how much energy do you use a day and does your PV array meet that demand on the shortest day of the year, when the least amount of sunlight is available? If the answer is no, then you are going to need to run a generator or some other power source daily to make up for the difference. Even if the answer is yes, though, you’ve got to plan for the worst by oversizing your battery bank so that you have enough battery capacity to last you through an extended patch of inclement weather–up to 10 days if you’re really paranoid! The real benefit of having such a system is that it will be a fairly simple system wiring-wise, and you won’t have to worry about equalising battery bank by running a generator (see the upcoming entry on battery maintenance). You’d also get to brag to your greenie friends and neighbours about how your home being no slave to fossil fuels. The downside, however, is that if something goes wrong with your system, like you run out of juice after two straight weeks of rain, or there’s a short circuit that drains your batteries without you noticing, you’re going to have to wait for the sun to come out and charge your batteries up again. In the meantime, you’ll be powerless. The benefit of having a generator connected to your off-grid system is therefore fairly obvious–when the sun lets you down, you’ll have a backup plan for charging your batteries. We’ll cover this topic in the upcoming entry about battery maintenance. The following is a back-of-envelope way to estimate the size of the PV array and battery bank you’ll need for a stand-alone system. It is a bit technical, but the concepts are not too complicated, and reading through it will give you some idea of what you need to consider when trying to size your battery bank. 1. Roughly divide your energy use patterns into two seasons–you might do this by looking at old electricity bills from summer and winter. It doesn’t have to be exact. Let’s say your daily average power use for summer (Oct-Apr) is 3kWh/day and winter (May-Sept), when you run a heater or electric blanket or something, is 3.5kWh/day. 3. Using this data you can calculate which month has the worst irradiance (sunlight per day) relative to your winter load. It’s necessary to set design your system around this to ensure you don’t end up running out of juice unexpectedly. 4. The next bit (sizing the PV array) is outside the scope of this blog and involves derating for temperature and dirt, amongst other things–someone can help you with the technical aspects of this. In any case, in our scenario your typical daily load for the month is 3.5kWh, and on an average day in June at your location you get around 4.1PSH. Let’s say you’ve got a 4kW PV array. As a rule of thumb, the voltage of an array is typically 12V for any array under 1kW, 24V for arrays between 1 and 3.5 or 4kW, and 48 for arrays over 4kW. Let’s choose a 48V system. 6. Batteries of course are not perfectly efficient in storing and dispensing energy, and you’ll have to derate them by about 10% to ˜oversize’ them, plus any deratings the manufacturer recommends for differences in temperature from standard operating conditions (assumed to be insignificant here.) 24.5kWh * 1.10 = 27.2kWh. 7. As over-discharging the batteries shortens their life span, it’s necessary to set a maximum depth of discharge (DOD) for the batteries, typically 30% (although in this example we will use 70%–not recommended in practice*). This is basically oversizing your battery bank again. 27.2kWh / 0.7 = 38.8kWh. If we divide this by the system voltage we get 38,800Wh / 48V = 808Ah. This is roughly the capacity we want our battery bank to have. 8. But we’re not done yet! Battery capacity is measured in Amp-hours (Ah), since voltage (V) for battery cells is typically 2V, 4V or 6V. (Amps * Volts = Watts, and Amp-hours * Volts = Watt-hours, for reference). Battery capacity varies depending on the rate (amperage) at which you discharge them. If you use multiple appliances simultaneously (i.e. at a higher amperage) you will actually consume more stored energy (i.e. at a higher discharge rate) than if you used them each separately, one after another for the exact same amount of time (i.e. at a lower discharge rate). This is why you see batteries rated with not one Ah rating, but typically 4 or 5, denoted by a C followed by a number in sub-scripts: C5, C10, C20, C50, C100, etc. This number indicates how long the battery will run at a particular discharge amperage, usually indicated on a chart like the one below. 9. For the next step you’ll need to imagine what appliances might actually be on simultaneously in your home, in Watts, then divide by your system voltage. Let’s assume some lights, your freezer, your fridge, and the television are often on at the same time, at a total of 867W. Since the array is 48V, this means we have 867W / 48 V = 18.2A. 18.2 Amps is our typical discharge rate, just to be on the safe side. 10. Voltage adds up in sequence, so if we choose 24 2V cells, we’ll have 48V, but we still have to choose a battery based on the discharge rate. Since we determined in step 7 that we need a battery bank of 808Ah, and in step 10 that our typical discharge rate is 18.2A, we can now select a battery that will give us what we want. 808Ah / 18.2A = 44.39h. We want a battery that will give us around 800Ah at its C45 or C50 rating. Luckily, the model highlighted above is just about what we want. The next installment in this series of battery entries will be about different battery types. *Text in Brackets added on 23 May 2013. Thanks to Michael O’Connell for pointing out the inconsistency in the calculations. I use approx 27 kwh per day and have a 9 kilowatt system connected to the grid & want to go to an off grid system. not sure of how many batteries I need yet but if I run out of power can I have a switch installed to go back to the grid. There is nothing commercially available that will allow you to ‘flick a switch’ and alternate between on-grid and off-grid. However,if you have battery storage and are grid connected you will require an energy management system or inverter charger – both of these will effective allow you to access the grid when you need to. With an energy management system you are able to program the system to draw from the grid when the solar panels are not producing energy and the battery is low (it is recommended that you do not completely drain the battery). It will aso allow you to do things like draw power from the batteries at peak times, thus reducing you energy bills to charges applied at non-peak times. There is a bit more information in our article ‘Solar power storage solutions: Beyond batteries‘. Just out of interest, is there any reason you’re looking to go off-grid? We’re aware that there have been rumblings in Queensland about the introduction of a Gross feed-in tariff which may make moving off-grid a good move for home owners, or is there another reason? I would like some advise on increasing and already existing battery bank capacity to at least double. I have a stand alone system – the batteries are only 3 months old 4x6v=24v system 375AH I can’t afford to replace the batteries – can I add to the bank and if so how do I go about it? Would really appriate any help I can get. Adding new batteries to a bank composed of older batteries is not advisable, as the ‘weakest link’ effect applies to batteries. This means that the older, less efficient/powerful batteries drag down the new batteries to their level. However, since yours are only 3 months old, you might be able to get away with it, provided there are no problems with them. For details, you’d have to speak to an off-grid system installer, however. Solar Choice might be able to introduce you to one in your area. Where are you located? So you’re looking for an off-grid solar power system, then? Costings depend mainly on how much power you expect to use when you’re there, as the size of the battery bank will depend first and foremost on expected power demand. Give us a ring or fill out the form to the right to get a free, instant, and impartial solar quote comparison for installers who might service your area. Thanks for the good article. We make Lithium-ion batteries for electric vehicles and energy storage systems. Why did not you include Li-ion battery banks in your article? Thanks for the comment. Lithium ion battery banks are still not the norm for off-grid solar PV systems, given their relatively high prices–lead-acid batteries are still standard. However, as you are probably aware, a the growth of the EV and energy storage system products are pushing down the price of Li-ion battery banks. They will likely be significantly cheaper in a few years, but as it stands now they are not the most price-competitive option for power systems. Just a question to you on how to go about utilising a solar set up to feed a bank of batteries on a small bush shack, understanding that it is all hard wired and has a 1.5 invertor to serve the panels, would appreciate some thoughts on this matter. Thanks for the comment. Not really sure what your question is, though! Do you already have a battery bank, or are you looking to get one? If you don’t have one yet, the battery bank’s capacity will depend on your usage. How often are you there, and what appliances do you run when you are there? deep cycle batteries. 1 is dead flat, is there a way to rescue it ?? all but one other are fully charged. Standard practice for replacing battery banks is to do the whole lot simultaneously. It is not advisable to replace just one cell in the bank because the older batteries will have reduced capacity through the ordinary wear and tear that they undergo while being discharged and recharged every day, and similar to solar panels, just one poorly operating unit can bring down the functionality of the entire bank. This will definitely be the case for your bank, where the older batteries have been around for eight years–adding a new one will not necessarily give you the performance that you might expect from the bank, as it will be ‘dragged down’ by the other batteries. The flat battery doesn’t seem to be affecting the overall performance. could it maybe replaced with a second hand one?? really cant afford to replace whole battery bank. You could shop around and try to find a second hand one, but that’s usually not the best way to go about it. If you have an electrician friend, it might be a good idea to have a chat with them! I assume you have done your best in maintaining the cell, and that it is a lead-acid ‘wet’ battery that you have to top up with water when necessary? Also, you haven’t noticed any problems with the overall output of your battery bank? It may well be charged, but is the loss in output proportionate to the loss of only one cell in the battery bank? Yes, you maybe right only one cell buggered. the electrician i spoke to said to separate it and charge it alone which i did. the battery charged , but was still in the red on the hydrometer. reinstated it with rest of the bank, held the charge for a fortnight and now not registering at all on hydrometer. dont know what to do next ? Hi Rob. Thanks for the inquiry! We at Solar Choice provide free quote comparisons for different systems, including stand-alone (off-grid) systems like the one you’re talking about. You can also give us a ring on 1300 78 72 73 and we can talk to you about your options. How big a battery bank you’ll need and how many panels you’ll need will depend almost entirely on how often and how long at a time you intend to use your weekend house, and also to a degree on where it is located (different areas get different amounts of sunlight per day). Your system will be relatively small since you won’t be using it every day, and the risk of running down the batteries by using them over a long period with no sun (i.e. no battery recharging) is lower than if it was your first home. Can you give me a rundown of how many hours a day and how often you think you’ll be in the weekend home? Nice article James! Very complex process by the look of it, can’t wait for the next installment. You could simply leave that cell out and cut your losses (as long as that won’t cause a problem with the output of your battery bank), or look into buying a new one to replace it and see how it goes. In any case, good luck with it!